Although the government fell over a month ago (after the main ruling party, the Croatian Democratic Union – HDZ, voted no confidence for Prime Minister Tihomir Orešković), it holds on to its influence on Croatia's public service broadcasting (HRT). Meanwhile, the ideological and politically motivated clean sweep in HRT by HDZ officials is in full swing. Last Friday, the transitional government initiated the procedure for amending the law on HRT by extending the mandate of the Acting Director from the current six months to a year. The Croatian government defined this move as "necessary to maintain the vital functions of HRT". This way, the government would be able to extend the mandate of Director pro tempore Siniša Kovačić, which expires on September 4th – exactly one week before the date scheduled for early parliamentary elections. In March, the parliamentary majority removed then general manager Goran Radman and replaced him with Kovačić for six months, waiting for a call for the post of Director that has never materialised. Kovačić, a long-time HRT journalist, is a rather controversial figure. Until his appointment as pro tempore Director, he was the president of the Association of Croatian journalists and publicists (HNiP), which often criticises non-profit media and alternative artists and is considered by many the long arm of HDZ in the media. Indeed, since HDZ lost power and is preparing for elections in September, it is obviously trying to extend its influence on HRT and use it during the election campaign. The Croatian Journalists Association (HND), without getting into the legality of the government's move, criticised the announced amendment of the HRT law as a government attempt to maintain "the current state of HRT until the elections", adding that such course of action totally ignores the position of HRT's very control body, which requires the appointment of a new director pro tempore. The government, with controversial culture minister Zlatko Hasanbegović handling the media, had been repeatedly reprimanded by international institutions for its restrictive media policy, in particular on the non-profit media, and the politically motivated clean sweeps at HRT. While the non-profit media have been hit by cuts in funding, HRT is experiencing one of the most severe and rapid clean sweeps in its history. Over 80 people have been removed or have lost their jobs in a few months, causing a significant lowering of professional standards. The main news programme, the legendary Dnevnik, has sunk in viewing rates and given way to the competition. In recent weeks, many radio and TV broadcasts on the third channel have been terminated. These were programmes about culture (both mainstream and alternative) and science, rich in documentaries and non-mainstream films. As Acting Director of the Third Radio channel, Nevenka Dujmović closed an entire series of broadcasts. 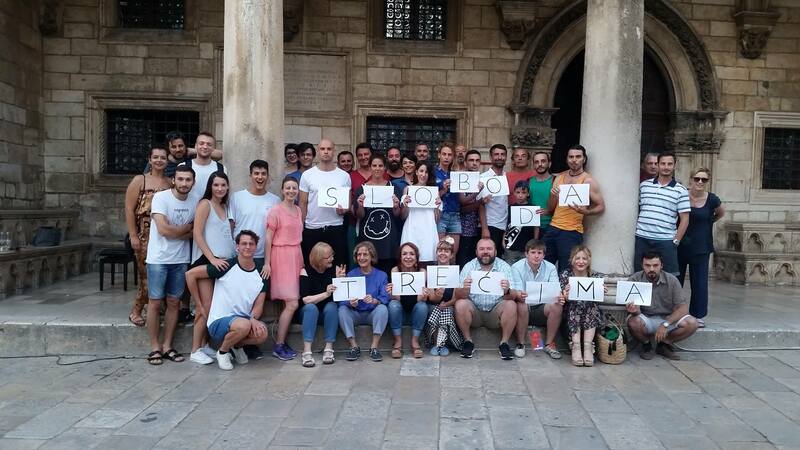 In early July, two programmes were cancelled: Audio Doc and Skrivena strana dana, conducted by Ljubica Letinić, awarded this year by the Association of Croatian journalists. The very popular programme Jutro na trećem, where poet Ivica Prtenjača invited cultural professionals, artists, and scientists was also cancelled, and so were Kultura demokracije, Lica obolice, and Pojmovnik postjugoslavenske književnosti. These programmes, as announced, will be replaced by others of strong conservative character. Future conductors include Jure Vujić, who admitted plagiarising the work of Professor Dejan Jović of the Faculty of Political Sciences in Zagreb and is also – paradoxically – the president of the Ethics Forum of the HNiP. Another "coincidence", as noted by the Kulturnjaci 2016 [a group of intellectuals and artists who made a petition to dismiss the Minister of Culture] is that Vujić printed his book with the publishing house owned by Hasanbegović. "If you don't know what I am talking about, I suggest you listen everyday to the Third channel of the Croatian Radio and to the 'postmodern', neo-Yugoslav 'deconstruction' and dissolution of Croatia's cultural and national identity, obviously not funded by lottery money, but by Croatian taxpayers' money", stated Hasanbegović in an interview for the Catholic Glas Koncila in 2013, prophetically anticipating what would happen three years later. While Dujmović declined to comment, last week HRT rejected all allegations of clean sweep and repression of the freedom of journalists. The third channel of Croatian TV had already undergone drastic changes with the dismissal of managing editor Dean Šoša, the person who had made it a high-quality channel. The historical broadcast Treća Povijest (Third history), conducted by university professor and historian Tvrtko Jakovina, was also cancelled with no official explanation. Jakovina sarcastically commented on the statement by HRT about the programme not being sufficiently "inclusive", referring to all the countries of origin of the eminent historians who have participated in the programme. The layoffs and cancellations on the third channel have produced a new civic initiative, Sloboda Trećima (Freedom for the Third Channel), that seeks to resist the ideological reshaping of the channel. Last week, the initiative organised its first demonstration in the Square of the victims of fascism in Zagreb, with live radio broadcast. "The media, culture, and freedom of expression cannot afford to depend on election results, whatever they may be. Some values ​​cannot be questioned by any election or referendum", reiterated writer and journalist Ivica Đikić during the event, adding that the government is just trying to bend the media space to its ideological inclinations. "We cannot trust that the government, whatever it may be, will respect the freedom of information, expression, and speech no matter what – rather, we must be skeptical and resist any attempt to restrict these freedoms", concluded Đikić. Journalist Boris Postnikov, former editor of Pojmovnik postjugoslavenske književnosti, expressed the hope that quality cultural programmes will continue once "the right's attempts to impose its cultural policy deflate".